William Joseph Donovan’s life was packed with personal drama. The son of poor Irish Catholic parents, he married into Protestant wealth and fought heroically in World War I, where he earned the nickname “Wild Bill” for his intense leadership and the Medal of Honor for his heroism. After the war he made millions as a Republican lawyer on Wall Street until FDR, a Democrat, tapped him to be his strategic intelligence chief. A charismatic leader, Donovan was revered by his secret agents. Yet at times he was reckless—risking his life unnecessarily in war zones, engaging in extramarital affairs that became fodder for his political enemies—and he endured heartbreaking tragedy when family members died at young ages. J. Edgar Hoover had FBI agents dig up dirt on him. Donovan stole secrets from the Soviets before the dawn of the Cold War and had intense battles with Winston Churchill and British spy chiefs over foreign turf. Separating fact from fiction, Waller investigates the successes and the occasional spectacular failures of Donovan’s intelligence career. It makes for a gripping and revealing portrait of this most controversial spymaster. 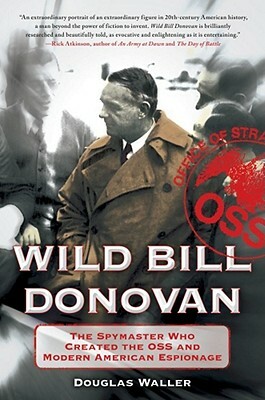 In Wild Bill Donovan, Douglas Waller brings the larger than life William J. Donovan – a World War I Medal of Honor winner, Office of Strategic Services founder, CIA architect, and one of the 20th century’s most compelling figures – to life. Waller's impressive skill as a journalist, his expertise about the U.S. intelligence community, and a remarkable writing ability complement one another in this fascinating and insightful portrait of Donovan the man, not the myth, and enhances our appreciation of his remarkable legacy. General Donovan attributed much of the success of the Office of Strategic Services to “good old fashioned intellectual sweat.” This informative, enjoyable, and important book deserves the same compliment. --Charles Pinck, President, The OSS Society, Inc.